Are Those Veggies Safe to Eat? At the supermarket, I usually see an abundance of fresh, flawless vegetables. The vegetables are uniform in size and shape, and completely untouched by insect marks of any kind. As a organic farmer though, I can attest to the voracious appetite of nature. I have seen lettuce leaves pecked clean by birds, cabbages and corn devoured by insect larvae, cucumber and tomato plants infected by disease, and many crops damaged by slugs, snails and beetles. In conventional farming, the solution is to apply vast quantities of pesticides. Pesticides are substances that prevent or destroy insects, weeds, and diseases that affect crops. This is chemical warfare against nature. In fact, many modern pesticides are chemically similar to chemical warfare agents developed during WWI and WWII. For example, organophosphates are the basis of many insecticides, herbicides (that are approved for agricultural use) and nerve gases. According to wikipedia “They are of concern to both scientists and regulators because they work by irreversibly blocking an enzyme that’s critical to nerve function in both bugs and people. Even at relatively low levels, organophosphates may be most hazardous to the brain development of fetuses and young children. They can be absorbed through the lungs or skin or by eating them on food”. The “safety” of approved pesticides is also commonly compromised by misuse. Farmers may apply more than the recommended amount or they may apply it too close to harvest time. Imagine you are the farmer, and your crop will be harvested in the next two weeks. Months of hard work are about to pay off! But then you see those pesky insects leaving their bite marks on your crop. Do you spray the insecticide, even though the instructions say “do not spray within 14 days of harvest” or do you simply refrain from spraying and accept that you will earn significantly less or sustain a loss from your now insect damaged crop? As consumers, we rely on the government to ensure the safety of our food. The government of Hong Kong has indeed implemented many measures to ensure the safety of the food entering Hong Kong. For example, only approved farms on the mainland are allowed to export their produce into Hong Kong. However, as a government inspector told me, they would have no way of knowing if produce was brought into the approved farm, relabeled and then shipped to Hong Kong. The government also undertakes residue testing. However, only 0.0016% of all produce entering Hong Kong is tested. It is also prohibitively expensive to test for all potential pesticides and pollutants. Greenpeace has found banned pesticides on vegetables at multinational supermarkets in China. 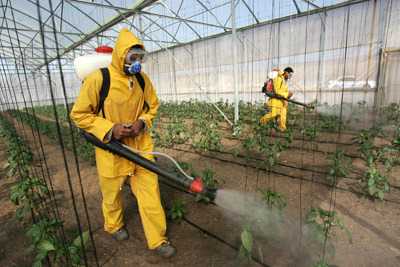 Farmers may also use various means to mask the overuse of approved pesticides or the use of banned pesticides. An agricultural consultant I spoke with mentioned that he had seen ionic water being used to wash vegetables at a farm in order to reduce detection of pesticide residue. Like a game of cat and mouse, the inspectors will always be trying to catch up. Another issue with testing is the standard which we are testing against. For example, in the Hong Kong standard, the allowable limit for lead is 60 times higher than in the UN Food and Agriculture Organization (FAO) and World Health Organization’s (WHO) Codex standard. I once worked at a farm in Taiwan that was growing some wonderful vegetables that were sold to clients in the city. There were some salad leaves that I was especially fond of eating. Everyday, I would go and pick a fresh head of lettuce and make a delicious salad. Then one day, one of the farm workers casually mentioned he wouldn’t eat any of the veggies grown on this farm. When I asked him why, he took me to see the stream which was used to irrigate the crops. It was quite dirty and had a strange reddish color. When I asked him why the stream looked that way, he took me further up the hill. There I saw an industrial chicken farm that was discharging its waste water directly into the stream. Not only was I being exposed to potentially dangerous bacteria, but I was also likely exposed to antibiotics being fed to the chickens. There are many potential risks to our food safety and ultimately we cannot rely on the government to address them all. So, apart from avoiding vegetables what can we do? Eating organic vegetables certified by a reputable organization can help avoid some of the hazards outlined above. If you’d still rather buy the latest iPad than invest in your health, an alternative is to wash your vegetables very thoroughly. A college professor told me of a lab experiment her colleague had done with her students. They had conducted residue testing on produce bought from the supermarket (which they found to have very high levels of pesticide) and then tried various methods of washing them. They found that soaking the vegetables in salt water for an hour and then rinsing them 3 times afterward to be the most effective way of reducing the pesticide residue. I once got a bag of pak choi in supermarket cos it was too late for me to shop in wet market which selling local produce. Even thou I washed the pak choi through, still, I got serious headache and vomited afterward cos the pak choi tasted chemical. I came across your column looking for ‘mercury in spinach’ in China. I have been living in Shanghai for just over a year after spending 16 years in HK. The fact that everything in this city, air, water, food, people’s minds to a certain extent is polluted really bothers me. My grocery bills have gone up more than 3 times since moving here as we spend a lot more on organic meat and vegetables and imported packaged food. We have stopped eating seafood as the local rivers are filthy. I wonder if the local government will ever take any measures to clean the environment that we are living in here.